With more than 1,000 different geckos species known, the multicolored, smooth-skinned reptiles are tremendously diverse and well-adapted creatures. Innately cold-blooded creatures, they thrive in the wild in warm, balmy climates all over the world; and their beautiful appearance, fascinating footwork and unique vocalizations make them favorites among exotic animal lovers. Members of the lizard family, geckos display several characteristics that underscore their charming reptilian nature. Geckos come in many sizes, from as small as a half an inch long to as many as 14 or 15 inches long. Most notable, however, are geckos' small and delicate scales. These little reptiles are found in many colors, patterns and hues -- dark greens, blues and yellows, and vibrant stripes, spots or multicolor camouflage. But geckos share several other distinctive characteristics beyond coloration. Their bodies, for example, are usually rather small in proportion to their heads, compared with other lizards. Their heads are dominated by large, alert eyes. Geckos do not possess eyelids; rather, their eyes are covered by transparent membranes they clean with their long tongues, according to the Ark in Space website. Geckos' tails serve to store both fat and water, and typically compose a large part of their bodies. Geckos are capable of instinctively shedding their tails when threatened. The tail's muscles will still move after it separates from the body, distracting predators long enough for the creatures to escape. Fortunately, as with most lizards, geckos can regenerate their tails. But perhaps the most fascinating aspect of geckos is their feet: They have short and somewhat bulbous toes, the pads of which are covered in setae, or small hooked bristles. This amazing feature allows geckos to climb vertical surfaces and even scamper across ceilings. Unlike amphibians, which must stay close to water, geckos are adapted to life on land. They can be found in tropical rain forests, sandy deserts, mountains, beaches and even in homes, provided the climate is warm enough to accommodate their cold-blooded nature. Their specialized feet make them excellent climbers, so they are able to traverse almost any surface whether in pursuit of a snack or eluding predators. With eyes more than 300 times as sensitive to light than those of humans, most geckos are nocturnal creatures, although it's not uncommon to glimpse geckos in the daytime, when they must absorb the heat of the sun. As with most reptiles, geckos shed their skins frequently. For some species, this includes the tail. After shedding, geckos will usually consume this dead skin, which is rich in nutrients. Geckos are carnivorous or meat-eating animals. Their penchant for small insects, such as meal worms, mosquitoes, crickets and cockroaches, makes them a welcome presence in many tropical regions. 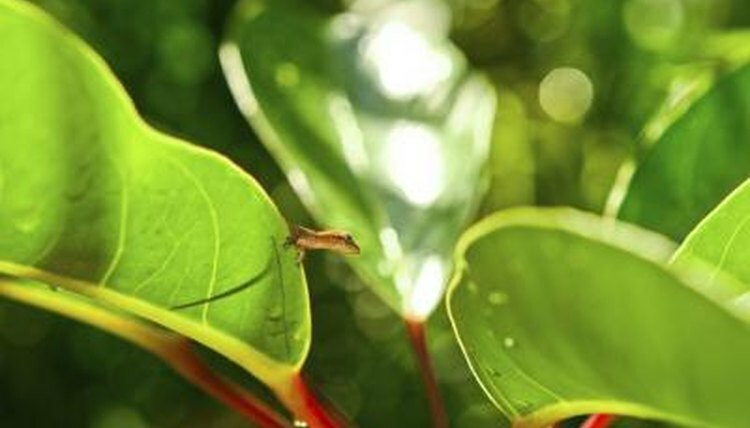 A gecko in the home is considered good luck in Hawaii. In addition to a variety of bugs, geckos will also prey on small mammals like mice and other rodents, immature birds, and bird and other reptile eggs. Even geckos' own eggs aren't necessarily off the menu. Reptiles and amphibians both lay eggs, but similarities otherwise are few. Amphibian eggs must be kept wet, as most species develop after a larval stage, a phase during which they use gills to breath underwater. It isn't it until they reach adulthood that they form lungs. Since geckos are reptiles, the females generally lay, on land, two soft, white eggs that harden quickly. Depending on species and habitat, gecko eggs can incubate for between one and three months before hatching. When they do hatch -- with fully functional lungs -- geckos receive no parenting and are immediately left to their own devices. Most gecko species will live about 10 years, though some species have life spans double that. Geckos make great pets for reptile lovers young and old. They require very little space and maintenance, are easy to feed and care for, and won't irritate allergies. Geckos tend to do well with humans and can easily become engaging companions. A vast number of species are available at pet stores and from exotic animal breeders. Some of the most favored pet species include tokay geckos, leopard geckos, giant day geckos, green geckos, white-lined geckos, frog-eyed geckos and Central American banded geckos. Before bringing home pet geckos, build them a warm terrarium home with a variety of natural items that would be found in their natural habitat. Chief among these items are vertical or near-vertical branches or other arrangements, since geckos are climbers.